This simple, high hydration boule relies on a bit of work after the bulk fermentation period in order to transform the shaggy dough into a tighter structure that will hold its shape. It is a little difficult to explain this process in a few words but there are lots of good video clips on the subject which you will find via a search on YouTube. Even though the oven will reach the temperature after 20 or 30 minutes depending on your oven's capacity, it is really necessary to wait an hour as the baking stone will take longer to reach its maximum temperature. 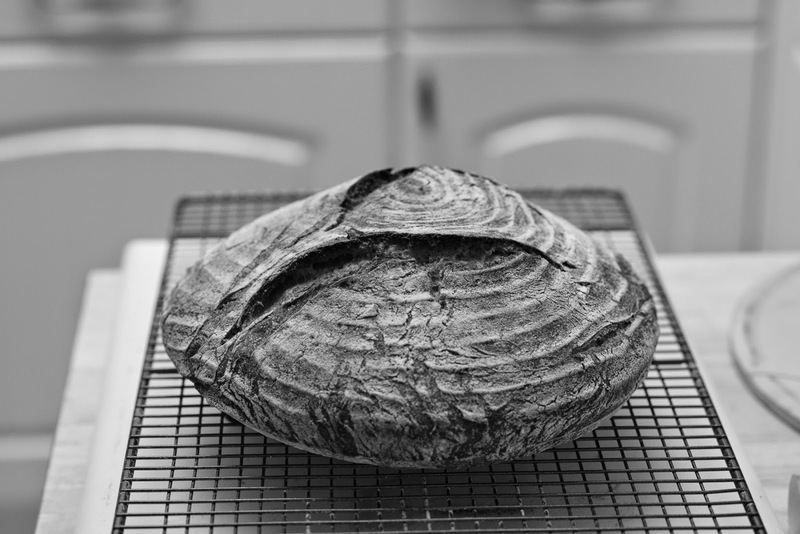 This initial contact with a very hot stone gives the bread 'bounce' or rise. Unless you are using the oven for something else, you can switch the oven off a good 5 minutes before the time is up as the stone with retain a lot of heat. Mix all ingredients in a stand mixer for 4 minutes on low speed and then 6-7 minutes on a high speed, until the dough comes off the sides of the mixing bowl. Cover the bowl with cling film and allow to rise in a warm place for 1- 1 ½ hours until the dough has doubled in size. Tip onto a lightly floured surface and gently stretch into a rectangle, fold the top third to the middle and then the lower third over that, now fold in half from one side to the other and press the seams gently together to seal them. If the dough is very loose, allow to rest for 15 minutes and repeat. Shape into a ball taking care to keep the surface structure intact as this will hold it together. Now pick up with a dough cutter and place the ball seam side up in a well dusted Banneton. I use white rice flour here as it is gluten free and tends to act less like glue making it easier to remove once it has risen. Cover lightly and allow to rise until it fills the Banneton - this will take about 60 - 90 minutes. Rising times will vary depending on the ambient temperature and these times are guidelines only and for nice warm conditions. Prepare the oven with a steam tray and preheat with a baking stone to 240 or at hot as you oven will go. Just before placing in the oven, tip a half a cup of water in the steam tray and close the oven so the steam does not escape. Tip out to the banneton onto a peel and score with a lamé. Place on the hot baking stone and bake for 25 minutes (10 minutes on 240 degrees and 15 on 200). 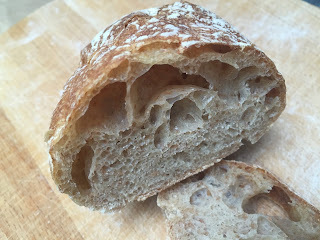 Whether or not what this recipe produces can still be called Ciabatta, aside from the 'slipper' shape of course, is debatable. 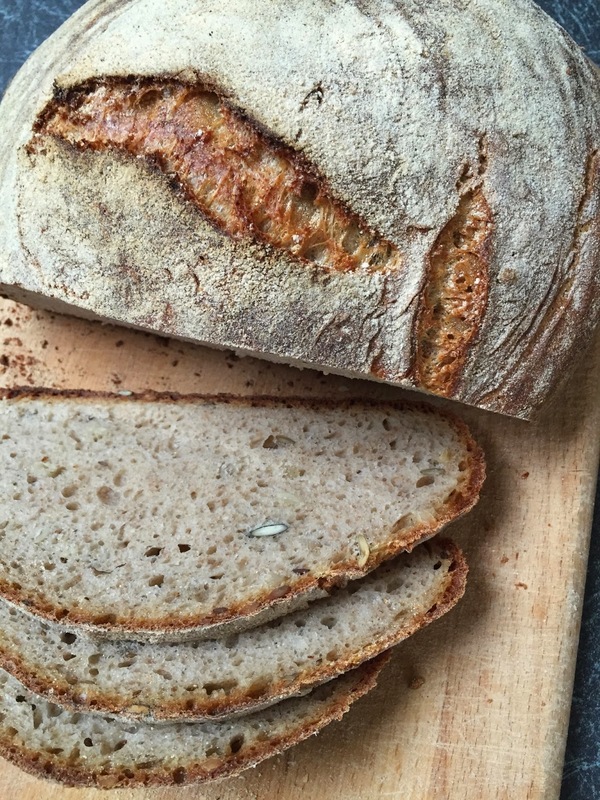 The spelt gives a rich, nutty flavour and is not as potentially bland as the regular Ciabatta made with Tipo 0. The basis of the recipe is from Ciril Hitz's excellent book Baking Artisan Bread. He also goes on to give good tips in the book and on YouTube as how to handle and shape dough with such a high hydration level. Mix the ingredients, cover and leave standing at room temperature over night (12 - 16 hours). Mix ingredients together in a stand mixer until everything is incorporated and the dough starts to clear the side of the mixing bowl, this will take 6 to 8 minutes on a medium speed. Pour the dough in to a large, lightly greased, proofing container, cover and leave to rest in a warm place for 30 - 45 minutes. The temperature of the dough should ideally be 25 - 26°C at this stage. Tip the dough out of the container and avoid scraping the dough out as this will interrupt the structure that is forming in the dough. Perform 2 sets of stretches and folds and return to the container for another 45 minutes resting period. Perform this process a total of 3 times. Although the dough is very wet, the structure will have built up and will hold together well. After the last stretch and fold allow to rest for 30 minutes. Divide the dough into 6- 8 equal parts for reasonable sized Ciabattas. Dust with flour and place on a couche. Cover and allow to prove for 30 to 45 minutes at room temperature. Bake in a very and humid (steam tray) hot oven to start with, reducing the temperature by about 10- 20 degrees and removing the steam tray one the crust is golden (about 10 minutes). Bake for a total of about 25 minutes. Ok, so I am not Italian, so if you have an issue with a non-Italian dabbling in making pasta, I suggest you move on. Now we have that squared away, back to my attempts at reproducing a good pasta. 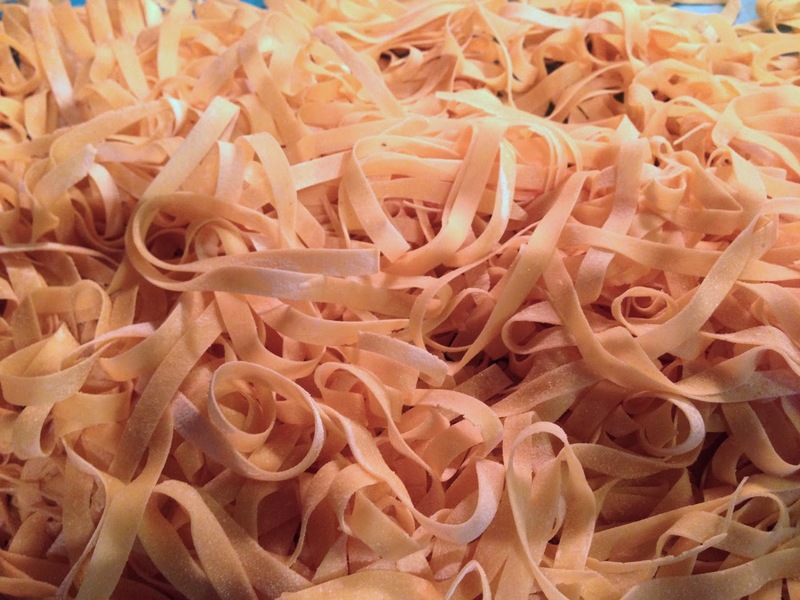 Generally one reads that the formula for fresh egg pasta is 1 egg per 100 grams of flour. This is an approximation, so I weigh the eggs and then determine the exact amount of flour in this case 1.7 times the weight of the eggs. Feel is more important though as well as using fresh eggs. Do fresh eggs really make a difference though? Gluten development is key to good pasta and that is best achieved when the pH balance of the liquid is pH 5-6. Freshly laid egg albumen has a pH of 7.6 - 8.5 increasing over time to 9.4. Fresh yolks have a pH of 6 and increase to 6.4 to 6.9. So, when using whole eggs freshness is important and if you use yolks only, the gluten development is better - that is the theory in any event. When it comes to developing the gluten, kneading by folding and stretching or pressing out and then rotating the dough by 90 degrees is not just a neat routine but makes sense as the network of gluten strands is important to build up in all directions to increase strength and elasticity. The dough will be right when it feels elastic and when you prod a finger into it it bounces back. The next step is to the leave the dough to rest. What is actually happening is that the Gluten is hydrating. Well to be more accurate the gliadin component of the Gluten is hydrating as the glutenin, unlike the gliadin is insoluble. Some recipes add gluten (around 4%) which seems very high to me and others add Xanthan Gum (1%), the effect of which is probably just psychological. Elbow grease in the kneading process is probably more effective! I start by mixing in eggs and flour, but holding back about 5 -10 grams of flour so I can still adjust how moist or dry it is. A stand mixer is ok just to get started but does not replace kneading properly to build up the gluten. Knead for 10 minutes or so until the pasta is smooth and elastic and cover with cling film and leave in a cool place for an hour to allow the gluten to hydrate. Divide into the ball into 4 equal parts and pass through the pasta roller a few times on the lowest (widest) setting until gradually thinning it out, not missing a number on the roller until the second highest setting. Place on a lightly floured surface and flip every few minutes until all the pasta is done. After about 20 minutes the pasta takes on a leathery texture and can be refrigerated or made into the desired kind of pasta shape. As we head into winter it is time to dig out the Caquelon and burner and enjoy a cheese fondue. Despite being not at all complex to make the results can range from being a coagulated glue on the one hand to watery and insipid on the other*. If you bear a few things in mind, however, you will easily achieve a reliable and delicious result. Firstly the wine; Swiss white wine is rarely found outside of Switzerland and when it is, it is either unaffordable or probably Petite Arvigne, which, while celebrated, is not ideal for cooking. In Switzerland the typical wine used for a fondue will be a Chasselas (Fendant as it is known in the Canton of Valais). This is a dry wine with good acidity and minerality. The acidity is key to melting the cheese and cutting through the fat. While Chasselas is grown elsewhere you will probably not find it that easily, so an alternative such as a crisp, dry Pinot Grigio works. If you do happen to see a Pouilly-sur-Loire, that contains chasselas and sauvingon blanc and works well. Steer away from oaked Chardonnay or anything approaching sweet or floral. Secondly the cheese - I know that being a 'Cheese' fondue I might have mentioned this first, but that shows much about my priorities. The principle here is that you have cheese that melts easily and some with more flavour. 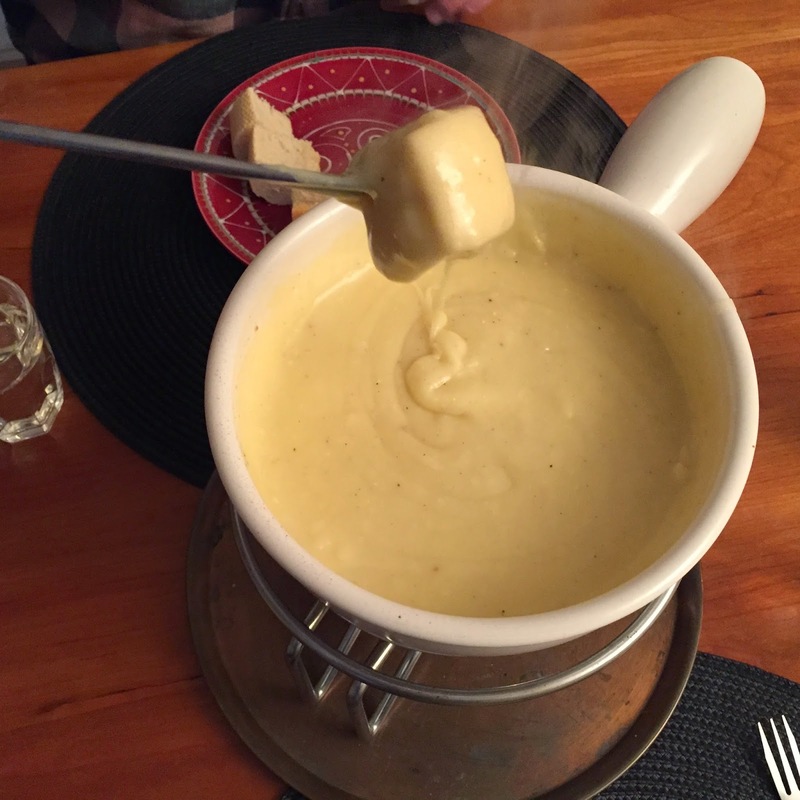 So at the one end of the spectrum a moitié-moitié fondue (half and half) comprising 50% Vacherin Fribourgeois and 50% Gruyère is the the simplest and a very popular fondue mixture in the French part of Switzerland. Combinations with Gruyère, Appenzeller, Emmentaler and Vacherin become more complex and the possibilities become endless. The amount of soft cheese such as the Vacherin will determine how creamy the end result. Vacherin is also not easy to find, so when you do, if like us you make a fondue regularly, buy more than you need and freeze 200g portions. Again it is possible to use a substitute. Quantities; I calculate 150g of cheese for a medium appetite and 200g for a big appetite. The amount of wine used is 50% of the weight of the cheese ; i.e. 500g cheese needs 250ml wine. * If you do happen to get a coagulated mess a teaspoon of lemon juice will cut the fat and help - also, remember to add the corn starch mix gradually! Firmly rub the inside of the fondue pot with a peeled and scored garlic clove. This will will add depth of flavour without an overpowering garlic taste. Then heat the wine gradually until it is simmering - not boiling. A trick here, for guests who are less tolerant of wine/alcohol (none of our guests fall into this category I hasten to add) is to use about 10% more wine and allow it to simmer for several minutes so that more of the alcohol evaporates but the final amount of liquid ends up being about the same as per the recipe. Once the wine is simmering gradually add the grated cheese in handfuls stirring continuously in a figure of 8. Do not stop stirring and it must be in a figure of 8 - ignore this advice at your peril. Once all the cheese has been added and has fully melted you will notice that there is slight separation between liquid and solids. This is normal and the extent will depend on the fat content of the cheese. Next, in order to bind the cheese and liquid, add the cornstarch mixture. This mixed with a little Kirsch (50mls should do it) for an authentic taste, but if this seems too strong or the alcohol is too pungent for your palate, then mixed with a little lukewarm white wine will work. You are still stirring. Once the fondue has reached the consistency of thick batter you are nearly done. Add a little freshly grated nutmeg and ground pepper and transfer to the gas or fuel burner straight away. Dip and stir bread into the cheese straight away, but after having decided the forfeit for someone who drops theirs in the caquelon. At the end of the fondue a crust will develop on the bottom of the pot. This religieuse, as it is known in the French part of Switzerland, is not to be discarded, rather scraped off the bottom and divided between among the believers. A way to extend the fondue when it is running very low on cheese is to whisk an egg into the remaining cheese after having extinguished the burner. P.S. Of course there are as many variations as your imagination can conjure up. Aside from using something other than wine, such as Cider, adding green or pink brined peppercorns into the wine before the cheese gives a bit of bite. Some people add fresh mushrooms or even sliced tomatoes. Personally, I prefer the simpler version occasionally with green peppercorns. 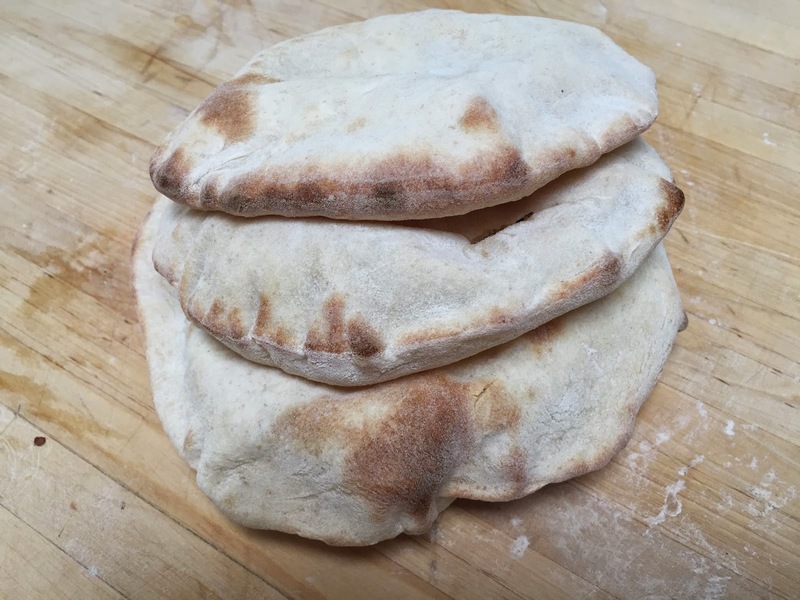 This is a recipe for 4 pita breads, obviously scale up as necessary. Larger thinner discs puff up and are more crisp, so decide how you like them before rolling out. Mix all the ingredients and allow to rest for 3 to 4 hours (given the low sourdough culture content). A good hour before the next step, heat the oven to the highest heat preferably with a baking stone inside - otherwise use a baking tray. Divide into 4 equal parts (around 100g each) and shape into balls, cover with a poly bag and allow to rest for 10 minutes. Roll into thin disks and bake on a hot stone for 3 minutes until puffed up, turn over for a minute and wrap in a fresh tea towel to keep warm and fresh. Tomes have been written on sourdough bread, so highlighting just a few points seems quite inadequate on the one hand or patronising to those in the know. So I will attempt to steer a course of discretion between the two. 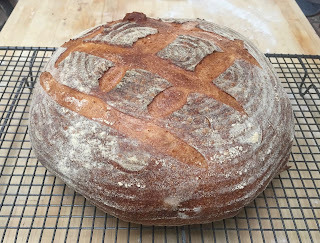 I have tried this recipe with both a Rye and Wheat starter and, while the Rye is more active, I prefer the wheat for now. The wheat starter has a 100% hydration level and therefor the hydration level of this recipe is 76% or 72% if you add seeds. So, obviously, it is going to need some work and careful handling, but the reward is the the crumb. Mix ingredients together, cover and allow to stand at room temperature for 12 - 16 hours. Place all the ingredients in a stand mixer and put on a medium speed for 6 minutes, finish off on high speed for a further 2 minutes. Pour into a large container, cover and allow to rest for 45 minutes. Place the dough on a lightly floured surface and stretch and fold the dough by gently stretching it into a large square shape and fold the top edge down two thirds and then the bottom edge up a third. Repeat the same left and right, cover and leave to rest for another 45 minutes. Repeat for a total of 3 stretches and folds. Place the the dough in a 1kg banneton dusted with brown rice flour, cover and allow to rise for several hours or until the dough has risen above the level of the banneton. Bake at 230°C for 25 minutes in a heated cast iron casserole dish and then another 15 minutes without the lid. Reduce the temperature to 180°C then remove the bread from the dish and place directly on the oven rack and bake for a further 20 minutes. It is important that the oven temperature is very hot to start with, this should be reduced by 20-30°C after 15 minutes. The total baking time needs to be about 45 to 50 minutes. If using a baking stone add a steam tray.